Soon Harry finds himself attending Hogwarts School of Witchcraft and Wizardry, where he receives training in some magic basics, masters riding a broomstick, and discovers his incredible talent for a game called Quidditch, which is played in the air on flying brooms. And for the first time in his life, Harry has friends who care about him: his fellow students Hermione and Ron and a giant named Hagrid. But all is not rosy when Harry discovers his true destiny and finds he must once again face the evil one who killed his parents. His survival will depend upon the help of his new found friends, as well as his own wit and powers. Like stated in my Question of the Moment yesterday i was the same way with Harry Potter as people are with Twilight, where they swear they will never read the books. I did see the movies and liked them and i did hear how amazing the books are, but i just wouldn't read them. After having so many people in my life who loved the books and kept pushing me to read them, i finally gave in, and i am so happy i did. Just like in the movies where you can just see that magical place called Hogwarts, and are dying to be able to go there, you get the same exact feeling and can picture it so vividly in the books. I think the part that i liked the most about the book was that it was exactly like the movie, with some expected differences here and there, but you never got bored or tired of hearing the same story. That was something i actually expected, because i saw the movie. I thought that i would get bored with the book, because it would be the same information re-said on paper, but it was actually as if hearing the story for the first time while reading it. As always i loved the characters. My favorite character is still the same as it is in the movies, which is Ron, and the two characters that i just can't stand didn't change either which is Neville and Dudley. I don't think i will ever like those two characters. Malfloy i always want to just deck a couple times, but he is the enemy so of course i feel that way. I also really liked how imaginative it all is. I don't think i could have ever envisioned a place like that. The entire book was just very, very nicely created and i don't think it ever went overboard. It all stayed pretty believable and never too much. I also love that most of the book was description text telling you what everything looked like, because no one has ever seen this place, or anything like it for that matter. To me, i feel that every kid has dreamed of being a witch or wizard and has wanted to find out its true and be taken to some magical place, or maybe that's just me, and i feel that Rowling has accurately described and made come true every kids dream. I loved this story. 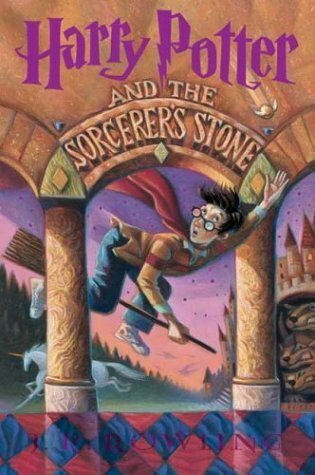 I was hesitant at first to read Harry Potter, because i thought it was just for kids and would be really intolerably childish and immature, but it wasn't at all. I really enjoyed the story and i loved the characters. The best part i loved was how descriptive it all was. I feel like Rowling did an amazing job at describing everything and making you really feel like it was all real. I recommend this book to everyone. I usually get more specific than that, but i think everyone will enjoy this.